After having successfully developed 1972 and 1973 Eastman Color Negative 7254 (ECN-1!) at home over the last few months which I shot in my Krasnogorsk (developed even in color, with an adpated C-41 process!) I was able to find a can of 400ft of its predecessor, 5251. Both films are of course ECN-1 still and I bought them purely for experimentation and for the fun of finding out how much of an usable image I can get from these with different processes. The can of 5251 I just received today however really confuses me, maybe some of you already have some ideas, before I investigate it more myself. I did not shoot any and did not devlop anything yet (will do that on the weekend), but I opened the can in my darkroom and looked at the film with infrared goggles (I use these often, they do not even fog new and fast film, so definately won't affect ISO 50 film that I assume by now has around ISO 1 or less). Anyhow, the tape around the can did not look like Kodak originally put it there like that and sure enough, the film inside was wrapped in a sheet of a newspaper, haha. This one was from 1963, so maybe that's when this film was bought, in case I can develop it successfully, the edge codes will tell me more... The film looked really clean at least with the IR goggles, not sticky and did not smell. It has negative sprocket holes as expected, but it is creme-white (instead of orange, or brown or black, or any other color I've ever seen on negatives in any stage) and also already shows edge printings that appear to either be feet numbers or any other codes used to indentify which machines made the strip in Kodak's factories. What is going on here? First I thought it might be the seller just sold me white leader film that turned creme-white over time, but wouldn't that have positive sprocket holes? 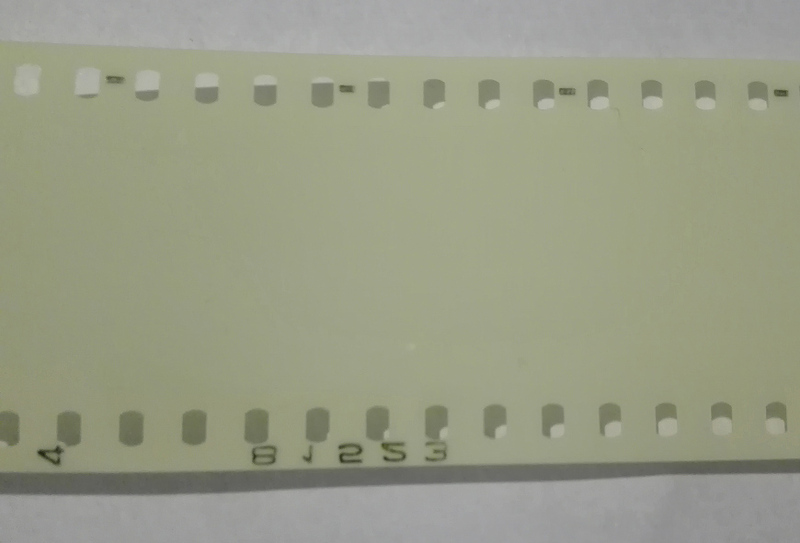 Or this is a strip of an already developed negative, which is why I can see the edge codes already, but why would anyone put it back in the can and tape it? Then I thought maybe 5251 did not have any remjet yet and also no orange masks yet, which is why it is neither orange, brown, black or such. But how come I would already be able to read edge codes before developing anything?! And if it was just fogged a lot over time, shouldn't the negative be very dark, for sure not creme-white! I guess I have to eventually spool through more of the film in the dark and look for clues and also just shoot and develop it in a few days from now, but still this all seems very strange. Kodak introduced a black backing layer to a motion-picture film in 1931. It became extensively used from 1935 on with Kodachrome and most other colour stocks. What you possibly have is an intermediate stock. Those use(d) to be ink stamp coded for the exacting work with trick machinery. By the colour you describe it could be a high contrast film, a black-and-white stock. If you could upload a sharp photo, we should be able to tell. See attached a picture of the film piece I cut off, for reference I put it on a perfectly white paper, so you can see the difference in color. As I thought, a black and white stock. It could be print film, Eastman-Kodak discontinued the ink marks on the perf web with all films in 1991 or 1992. The edge numbering points toward type 5302 with negative perforation for use in title cameras. But that is a real pity, especially since I bought that can to get Color Negative!! I checked and 5302 is mentioned to be released around 1988, so do you really think it's that one? I wonder how that 1988 film would end up being wrapped up in a 1963 newspaper and a 1962-1968 can? I really doubt the seller tried to cheat, because all he ever mentioned was that the can is sealed (which was true). Anyhow, so would you propose I'd rather develop test shots in B&W chemistry then? At least this way we'd see the actual edge codes. I mean, are you really sure it is NOT some strange color but actually B&W stock (no matter from what year)? Eastman 5302 is available since 1941. I am sure and certain that it is a black and white stock. Colour films look quite differently. As Arnie says: Trhusst me, Baby. So I will try B&W chemicals then. Thanks Simon! I don't believe that Kodak used ink edge printing on 5302 (B/W Fine Grain release positive) and it would not have edge numbers a it was a pos stock. It is possible that 5302 could have been produced with neg perfs but it would be unusual. Kodak duplicating stock 5366 (Fine grain duplicating positive) always had a 'D' prefix to the edge number. Incidently the horizontal line between the perfs indicates that the base is safety. I really have to develop some of it this week, didn't have time for it yet. Do you assume it will show more details on the edges after developing it or is what is printed on it now all there will be? Because then I might just look at the stock itself in my darkroom and look for any numbers like 5366 or such on it. I have just checked a copy of the Kodak Price list for 1977. It does show 5302 available with both pos and neg perfs. It would be worth developing a section of your film as there could well be other information printed as a photographic image. Possibly a stock manufacturer, perforator number and strip number for example.